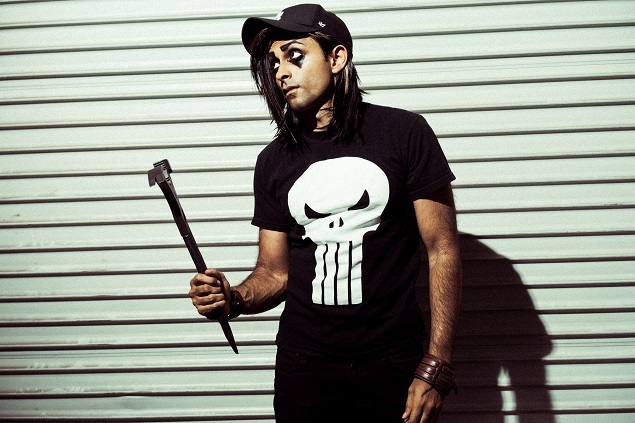 Film producer Adi Shankar. Photo Credit: Warren Remolacio. A guy in a cubicle, wearing a suit — this was Adi Shankar’s future according to his parents. But while they continued to search for a better life for themselves and their child by constantly relocating from country to country around Asia, their son dreamt of something else. Now a successful movie producer at only 30-years-old, he has found a new life in the Hollywood hills. Often found wearing dark face paint around his eyes (much like a rock star) that matches his shoulder-length, silky, jet-black hair and tan skin tone, Shankar might strike you as someone eccentric and unpredictable in nature. But what his choice of style fails to capture is his authenticity, charm and introspection, as well an openness that very few hold. It is these four traits coupled with his passion and dedication that have made him a force to be reckoned with, and led to the production of such films as Dredd, Killing them Softly, Lone Survivor, A Walk Among the Tombstones and The Grey. All of which were a hit on the film festival circuit and starred known Hollywood actors, such as Mark Wahlberg, Brad Pitt, Liam Neeson, and most recently, Ryan Reynolds (The Voices). Unafraid to take risks, he occupies a domain few have dared to enter: the world of superheroes and villains that can be found on the pages of one’s favorite comic books, including those fashioned by Marvel. Creating shorts for the Web based on these characters (when he’s not making his famously “violent and unapologetic R-rated action and crime dramas”), Shankar hopes to continue some of his favorite storylines — ones that fans are eagerly waiting for, Dredd (a film that was number one in the box office) being a case in point. And though he knows that his actions are sure to anger the studios somewhat, which might very well affect his relationship with them on future projects, he strongly believes that you have to challenge the system and continuously push the limits in this industry if you want to succeed and make a difference. “Don’t look for other people to validate you. It is a trap that you constantly keep falling into,” he says. Still, not every day is a serious and assiduous one for this bright soul. Much like any adult, he can be silly and rambunctious when the occasion to relax presents itself, often infecting those around him with his contagious enthusiasm and witty conversation. Don’t expect him to waver on his convictions, though, as they’re a piece of his life’s experiences and the cool ambience that resonates through him like the beating of a heart in a human’s body and soul. Quickly climbing the steep rungs of the success ladder, this talented go-getter joined GALO on the phone one late December afternoon to discuss just how he manages to wow the crowds and keep himself on top without conforming. GALO: GQ India recently named you one of the most “influential Indians” in the world. You no doubt have numerous other prestigious awards under your belt that showcase your talents in film production. But everyone has to start somewhere, right? I’m interested in where you stood before the accolades. What ultimately led you to your impressive film production career? Adi Shankar: I was actually thinking about this last night. Having grown up in so many different places in the world, I realized that the culture is always different. The way people talk, the language, [it’s] all different. But having grown up in the 1990s, that’s when movies really peaked (late 1990s, early 2000s) — everyone in the world knows who Tom Cruise and Will Smith are. I realized [then] that movies felt kind of like a way to bridge all of these little islands and pockets of my life that I kept picking up and moving as a child, leaving these shattered memories. There was really no other way for me to do that. I guess if I had the same experiences and I was a little younger, I would have probably done something more with the Internet, which is probably why I do all my bootleg stuff and why my digital content has become so prevalent in my life. GALO: I’m curious about the overlap of the film industry between the U.S. and India. I’m sure there are similarities between the two, but I am more intrigued by the possible differences. What are some aspects that make the two countries unique or their own when it comes to the industry? AS: The truth is, it would be very easy for me to give you one of these bogus blanket answers, but I’m trying to give you something thoughtful that is actually true. Entertainment is so fragmented today and yet so diverse. When we were kids, it was all about the mass markets. Today it’s about the niche market — and it is like that globally. Because of the Internet and the way we have access to information, both countries’ industries are evolving so rapidly. And I actually can’t give you a straight answer…but American culture and American ideology has really penetrated the Indian culture on a fundamental level. You look at the way Bollywood movies are shot; it’s emulating Hollywood. It’s like America is the gold standard. I was talking to a woman [some time ago] who is a Bollywood actress, and she was over here shooting a music video and wanted hers to look just like Jennifer Lopez’s music videos. It is almost like there is a colonial mindset there (in the Indian industry). GALO: You have also been named the youngest producer to ever have a number one rated independent film at the box office. When The Grey opened at number one in the U.S., what was your reaction — were you at all surprised? What do you believe made that film so astoundingly popular? AS: I was totally shocked. I didn’t really have a reaction, though I remember that day — I actually spent it alone. I was just kind of sad and I can’t explain why. I know exactly where I was sitting and what I was doing. I was just kind of bummed out. There might have been some inner sadness in me that I hoped would go away as a side effect of the movie opening as number one, but it didn’t go away [sadness is in reference to the end of the project]. I think it was popular because it was a very human story, and it came out during a time when everything else coming out was very hyperbolic and over the top, [whereas] this was a very relatable story in the backdrop of an action thriller.